Bees have value in medicine because their honey helps wounds heal. Honey is the thick liquid food bees make for themselves from flower nectar. At a time when drought, disease, parasites, pesticides, and Africanized swarms are killing off honey bees in large numbers around the world, it is important to consider the effects of bees beyond pollination. Honey has antibacterial qualities and has been used in the practice of healing and medicine since ancient times. The Egyptians, Sumerians, Chinese, Greeks, and Romans all valued honey, and honey is mentioned in both the Bible and the Koran. While the healing powers of honey faded in comparison to the new antibiotics introduced in the 20th century, today’s antibiotic-resistant superbugs make any substance with bacteria-fighting properties worth a second look. Honey is used effectively for wound care in hospitals and other medical settings around the world today. Derma Sciences, a Toronto-based company, manufactures a wound-care line called Medihoney, which includes honey from the blossoms of the manuka plant, Leptospermum scoparium, as an active ingredient in state-of-the-art wound dressings. The honey from most plants contains both hydrogen peroxide and methylglyoxal (MG), each of which contributes to the antibacterial properties of honey. However, the honey from manuka blossoms is especially high in MG.
Manuka honey is made from the nectar of New Zealand’s native “tea tree,” a large woody shrub with showy blossoms that range in color from white to deep pink. The people of New Zealand have had a love-hate relationship with manuka over time, with farmers considering it to be a noxious weed, and native Maori revering it for its healing properties. Captain Hook is reported to have made tea from L. scoparium leaves to protect himself and his crew from scurvy. Derma Sciences makes many styles of wound dressings, one of which is a calcium alginate dressing impregnated with manuka honey. The honey has a low pH of 3.5-4.5, which, along with its inherent antibacterial factors, creates an environment that is hostile to bacteria and has been shown statistically in research trials to correlate with wound size reduction. The alginate component of the wound dressing is made from seaweed, which is known to be highly absorbent and biodegradable. The Medihoney seaweed-honey combination forms a thick gel that pulls fluids away from the injured tissue and seals the surface of the wound. These properties create an optimal healing environment that remains both moist and bacteria-free. Best of all, the dressing can be rinsed away cleanly, so removing or changing the dressing leaves delicate new tissue intact and is relatively painless. In numerous clinical trials, these products have demonstrated impressive healing outcomes for wounds and skin irritations. The manufacturer advertises Medihoney as having both antiseptic and antibiotic properties, no side effects, and being all-natural. To maintain clinical standards for use in a sterile hospital environment, all Medihoney products are irradiated. 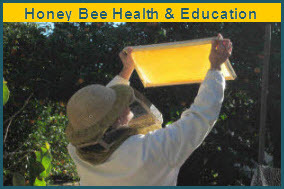 The clinical research backing the product’s effectiveness represents an impressive body of scholarship that recognizes the bee’s value in medicine, to the extent that the FDA approved Medihoney for use in the U. S. in 2008, thereby acknowledging that honey heals wounds. The FDA specifically approved Medihoney for “moderately exuding wounds,” including pressure ulcers, first and second degree burns, donor sites, traumatic and surgical wounds, leg ulcers and diabetic foot ulcers. However, independent trials conducted since 2008, and published in the medical literature, have drawn conclusions of insufficient efficacy evidence, showing that bees may not yet be valued in medicine quite as highly as they may deserve. In New Zealand, where manuka honey is produced, beekeepers first identified invasions of their bee colonies with the Varroa mite in 2001. The mite transmits several deadly bee viruses which can rapidly decimate bee colonies. Since its initial identification in the northern part of the country, the Varroa mite has spread to influence bee populations nationwide. With the source of manuka honey facing the possibility of a production shortfall, manuka honey wound dressings may also become scarce. The expanding Varroa mite range in New Zealand and other critical factors influencing bee health, including extreme drought conditions in the western U. S., have created a worldwide honey shortage. Reports are that honey prices have almost doubled over the last eight years. In one isolated example of the downward trend, California’s 2013 honey production was less than 40 percent of its 2010 value. That bees have value in medicine is clear, especially when the world is under siege by superbugs and has limited options available for fighting them. As the world works together to develop new tools and solutions, it is important to know that honey heals wounds.